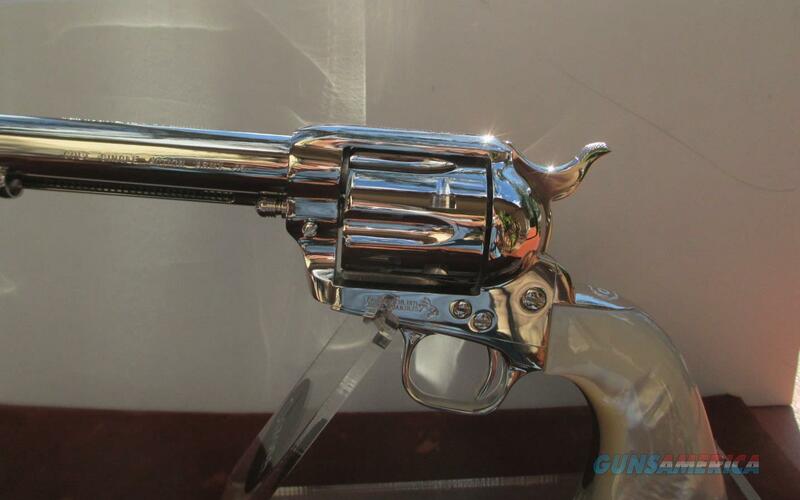 Description: FROM MY PERSONAL COLLECTION: A PAIR IN SEQUENCE OF COLT CUSTOM SHOP NICKEL SAA'S WITH 5 1/2" BARRELS AND GENUINE MOP GRIPS IN 45 LC. BOTH GUNS HAVE AN EXTRA PAIR OF FITTED 45ACP CYLINDERS, BEVELED CYLINDERS, ELONGATED FLUTES, STEEL CUT SERPENTINE COLT ON TOP OF BACKSTRAP, CUSTOM TUNED ACTIONS, AND QUALIFIED SCREWS. PRICE IS FOR ONE GUN AND REPRESENTS A 3% DISCOUNT FOR CASH.